Pixel stuff for current work - "Journey to Hammerdale", zelda-like adventure. 4 frames for each direction, right? from what i can tell it looks like you have the basic pendulum motions right except that there's a jerkiness in the animation that's preventing it from looking very smooth. i do notice in some of them that her entire body moves a pixel here or there where it shouldn't—which makes a strange jumping effect (ex in the first image she seems to jump a little horizontally and in the second one she jumps vertically). while the body should move up and down a little during the walk cycle, it should be in a sqash-and-stretch kind of way, not moving the entire thing. also i checked that link and dude i love the trees in the screenshots. I saw this logo though and thought I had become dyslectic. Is it just me or is that logo extremely hard to read..
edit: why is the crack between her breast blinking? It's legibility is way too low, yes. I'm huge into logo/brand design and I must slap this down with my mighty backhand of design tyranny. The graphical treaments, although a little excessive, are very nice and give a great visual appeal. But it doesn't work. 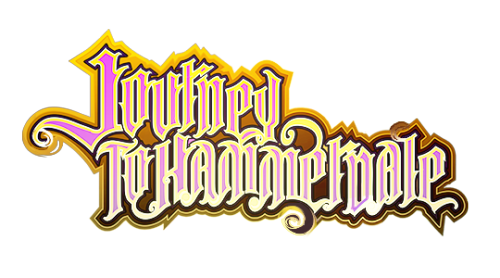 My best interpretation is Journey to Hammernale. The lowercase "r" tells me to read the capitalized "D" as "n". One quick improvement he can do is get rid of the yellow stroke inside the purple letter shapes and let it all be purple. Nice use of nested strokes via Illustrator but come on naow. looks like i should synchronize all these "jumps"
i don't understand (( what you mean? The lowercase "r" tells me to read the capitalized "D" as "n". Nice logo, but still I'm afraid preeetty hard to read. Your frames move about too much, making the animation jaggy/skippy instead of fluid. Walking is a pretty uneventful motion. Is it just me or is the beltbuckle in the south walk moving in the wrong direction? This is a really nice sprite by the way. While I appreciate your willingness to take direction, I have to be honest and answer - no. I think you regressed. -Colors are washed out. Looks like you have a contrasty gradient blending in too strongly now. The yellows got really boosted somehow. Almost makes me want to see if your display is calibrated (displaying full range of luminosity efficiently/correctly). -It appears you took a vector logo, rasterized it and did some smudges/swirls in Photoshop. If you did this in vector, keep it in vector so it's resolution remains infinite, creating raster-stylized versions only where necessary. 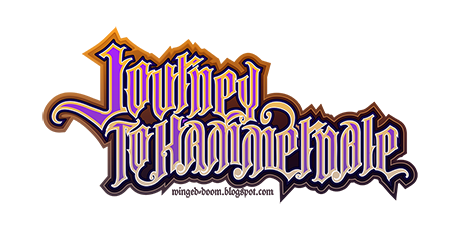 -That curl manually added to the "e" in Hammerdale doesn't work for me; doesn't match the scripty style of the typography. -Try adding in some ornate olde english or celtic knotwork flourishes to frame in the letters; occupy the negative space inside the logo's implied rectangular bounding box. I offer crit because I like it, and I hope you can improve it a bit. It is a very interesting logo, it just needs to be reigned in a little. try this. this would make it a lot more readable. the first time i saw the logo, i couldn't read it at all until i read the name of your game. even then, i could still barely make it out. if you want a logo to be successful, it has to be instantly understood and readable. also, i'd have to agree with Mathias. i like the first version's colors better.